How Many Pictures Do You Take With Your Digital Camera Each Year? How many pictures do you take daily?… weekly?… yearly? And what are you doing with all of those images? I’ve had a digital camera since May 24, 2003. Since that day, I’ve taken 23,172 digital images (…actually more, those are just the ones I’ve saved). That averages out to over 5,000 digital pictures each year! But then, I’m not the norm. I take my digital camera with me everywhere I go! And I’m not embarrassed to whip it out, even in some of the most inopportune times. Still, I am so thankful for those times that I’ve been in the right time at the right place and managed to capture a digital image of something. How Do You Organize All Those Photos? From Day One, I’ve used Adobe Photoshop Album (not the same as Adobe Photoshop) to organize all of my photos on my hard drive. It’s completely AWESOME. I use the $30 paid-for program, rather than the free version. Many computers & software bundles used to come with the free Adobe Photoshop Album Starter Edition. If you see it, you may want to try it! This includes over 4,000 additional photos that were not taken with a digital camera. Some, were actual photographs (taken with my “older” cameras, or received from friends & relatives) that I scanned myself then saved as digital images on my computer’s hard drive. Others, were professionally scanned at a photo lab and saved onto CD. I then imported those images from CD onto my computer’s hard drive. The best part of all this: All of my photos are now organized (and “tagged” for easy retrieval when I’m searching for a certain photo, or certain “type” of photo) in my favorite photo organization program: Adobe Photoshop Album. I temporarily imported all of my photos into Adobe Elements (a necessary step to preserve all the “tags” that I had attributed to my photos). I simply downloaded a FREE 30-day trial for this purpose. Then, I immediately imported all of my photos (and their respective “tags”) into Picasa. I love Picasa for these reasons: (1) ease of uploading; (2) ability to view — and share, if desired — your photos online with Picasa Web Albums (I set my albums to “private” and use it solely as backup storage for all of my digital photos. I save a full-size copy of each photo there. I paid for extra storage since I have so many photos); and (3) due to its popularity, there are lots of great apps and tools for Picasa. 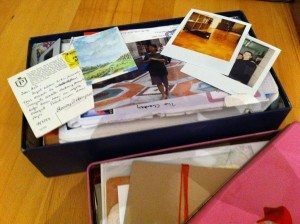 Digital Photo Storage: Where Are YOUR Digital Photos?